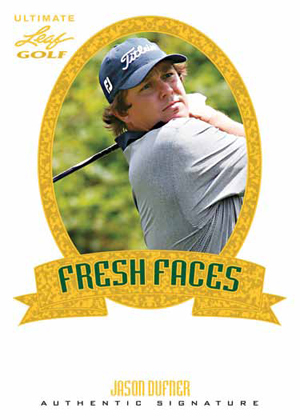 The resurgence in golf cards continues with 2012 Leaf Ultimate Golf. Following the success of 2012 Leaf Metal Golf, this is another all-autograph release. Boxes come with three on-card signatures. Signers include such superstars as Jack Nicklaus, Michelle Wie, Arnold Palmer, Fred Couples, Annika Sorenstam and Sergio Garcia. 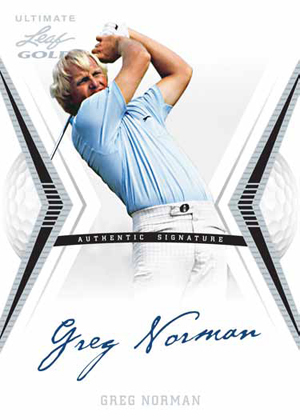 2012 Leaf Ultimate Golf is also the first set to have certified signatures of Greg Norman. Other first-time signers include Jason Dufner and Cheyanne Woods, Tiger's niece. Like other Leaf releases, base autographs also come with several parallel versions to further fuel the chase. All are hard signed directly on the card. 2012 Leaf Ultimate Golf also has several themed inserts. 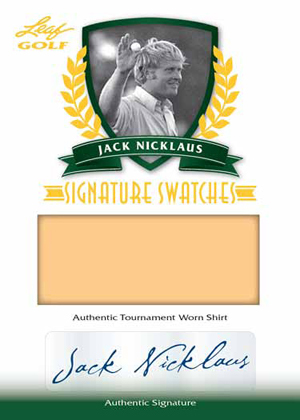 Signature Swatches includes pieces of match-worn shirts from PGA legends Jack Nicklaus and Arnold Palmer. Using a hozizontal design, Major Winners honors those who have won either the Masters, British Open, U.S. Open or PGA Championship. 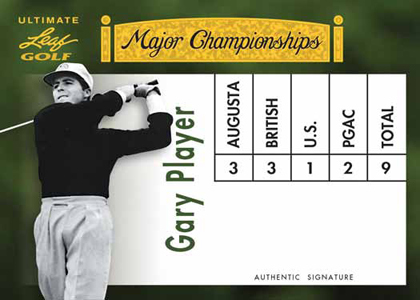 Numeration cards have the number of the featured golfer's tournament wins included on the card. Finally, Fresh Faces celebrates the short's up-and-coming stars. 2012 Leaf Ultimate Golf is limited to 340 12-box cases (4,080 boxes). After going many years without any full golf card releases, the hobby now has three in 2012. Besides 2012 Leaf Ultimate Golf, there is also 2012 Leaf Metal Golf and 2012 SP Authentic Golf from Upper Deck.